Note: it is very difficult to find equivalent sounding words for the above vowels in English. Don’t worry about these for now. Learn the main 28 as in my chart below. Now, not all vowel forms follow consonants; some appear above consonants and some below. Complex form vowels — composed of more than one part — can be placed around the consonant(s). Vowels are separated into short and long.There are 14 long vowels and 18 short vowels. For example, the first vowel is sara ‘a’ (short), followed by the long version sara ‘ar’. 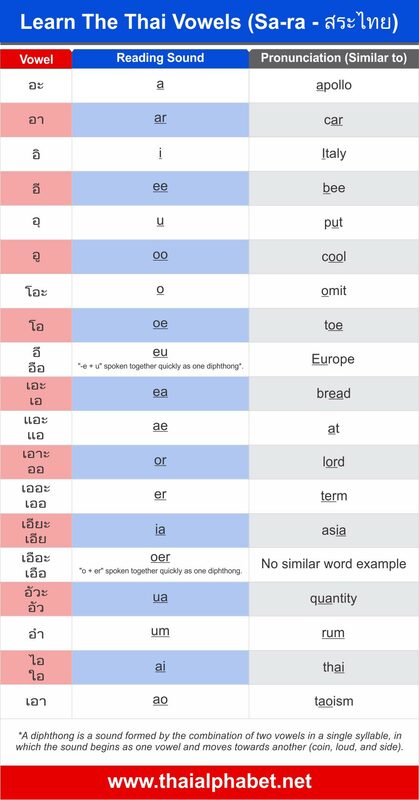 Thai vowels are pretty complicated because people have different takes on how the sound should be written in English. I’d start learning the consonants first!